Why Gratitude? This concept is backed by multiple studies linking gratitude to physical, emotional and social well-being. Research shows that people who focus on gratitude are happier, more resilient, more empathetic and have stronger interpersonal relationships. Additionally, they have less stress, sleep better and take better care of themselves. So the question is: How do we PRACTICE gratitude so we can LIVE gratefully? 31 days of Gratitude is about integrating specific ACTIONS into our daily lives and PRACTICING it — by doing something different throughout the year, 31 days at a time. Here are three Fall-oriented practical (and fun) ways to put gratitude into ACTION this season. What is 31 Days of Gratitude Messages? Between Thanksgiving and Christmas, practice 31 days of gratitude by sending a message of gratitude to 31 people who have significantly impacted your life over the year. Instead of Black Friday shopping, spend your Thanksgiving evening making a list of people you are grateful for. Identify those people who have impacted your life in a positive way over the past year. Then beginning on the Friday following Thanksgiving select one person each day, and send them a text message or an email. “So (Insert Name)…..I say a prayer of gratitude for you today and I am grateful that God has put you in my life. For each of the 31 days, copy and paste the Intro and closing message but make the heart of each message very personal, specific and meaningful to the individual you have selected. Make this the first thing you do when you wake up each morning — it is a great way to start your day! Every year, my life is profoundly changed by the people that have crossed my path and through this practice, I am able to reach out and tell them how important they are to me, what makes them special, and why I am so grateful for them. We are meant to make connections, yet the busyness of life – especially during the holidays — can overtake us. This is a way to center my life on what is really important, being grateful and living a life of connection. The act of telling someone what they mean to you and how they have impacted your life can be a powerful experience for both parties, and creates connection in a deep and meaningful way. Along with the impact you will undoubtedly have on the 31 people in your circle each year…practicing gratitude can have a ripple effect. 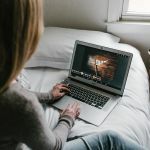 I shared this with my friend Mary LeVorde, a Work-life balance guru who is the author of four books, a sought out international speaker, and a repeat guest on Oprah. In November of the year I attended one of Mary’s powerful retreats, I included her on my list of 31 people who impacted my life. “Tears on my keyboard today. Whew. Thank you so much. I treasure you and treasure our friendship. Your note here will remain in my heart forever. As will you”. “Thank you for your warm email acknowledging gratitude in your life and as a reminder that we, too, need to take time to acknowledge gratitude”. Implement this powerful process and see how you can positively impact the people in your life. Here is a fun idea to integrate into your fall tradition. Beginning Oct. 1 (this can also be done in November ! ), buy the best pumpkin you can carry home and grab a sharpie. At the end of each day, write one thing you were grateful for. Make this your October table centerpiece. It is a great way to train your brain to find that “diamond in the ruff” – the one thing that stood out, even on bad days. 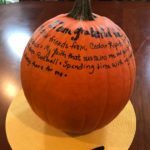 For families, it can be a fun way to teach kids about being thankful and they can look forward to writing something on their Thankful Pumpkin each day! At the end of 31 days read all your blessings and then, well, it’s time for the pumpkin to be returned to the earth — a symbolic reminder that we should not take any of our blessings for granted. For those that want to hold onto the memories, foam pumpkins can be used to save year to year. 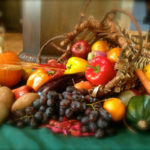 The cornucopia as a symbol of plenty – consisting of a goat’s horn overflowing with flowers, fruit, and Fall vegetables. It’s symbolic of prosperity, good fortune, fertility and abundance to demonstrate our thankfulness of the harvest. Instead of filling it with the traditional harvest gatherings, personalize it with your blessings. Beginning at Thanksgiving, place a cornucopia on the table. Each day, take a piece of fall-colored paper and write a blessing of thankfulness. Place this in the cornucopia to remind yourself of your personal “horn of plenty”. Variation of a theme – This can be a great family activity. Each night before dinner, ask each family member to record their blessing, read it to one another and place it in the Horn of Plenty before eating together. It is a great way to learn what is important to each other while having some fun in the process. Gratitude in action can be a powerful process and the benefits of sharing one’s thankfulness sends positive energy into the world. Even though this practice has been a holiday tradition for me – you can implement at all times of the year. I encourage practice gratitude – 31 days at a time. If you have a practice for gratitude, we would love to hear about it! Please send an overview to info@ithrive31.com. This year, we have started a gratitude jar. Each day, each member of the family writes what they are grateful on a small paper disk ( a little like coins in a bank) and shares it with the family and puts it in the jar. At this time of the year in particular, we tend to become a bit more focused on our wants rather that acknowledging how blessed we already are and recognizing where we have excess to share. 3) What is the impact? Gratitude affects mental well being and connects us as a family. We have reminisced. We have realized how lucky we are. We have laughed about what my 4 year old in particular has shared. The first week was easy as we ran through the people in our lives, our work, our health. It has taken a bit more time as we have neared the end of the month. We (as parents) have also noticed that our kids notice EVERYTHING we say and do. Our 4 year has us write her gratitude for the right to vote 🙂 She knows she is impacted by that even if indirectly. This time of the year can be busy and frustrating and stressful while joyful as well. This is creating some balance.